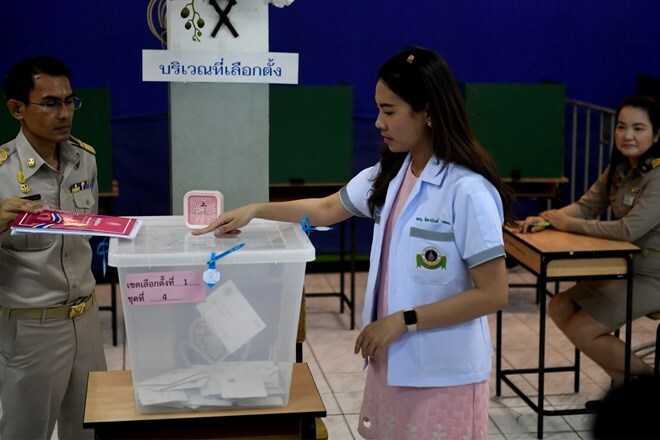 Bangkok (VNA) – Political parties said on March 22 that they were ready for the election scheduled for March 24, while introducing new policies to win voters’ support. The Palang Pracharath Party (PPRP) has touted Prime Minister Prayut Chan-o-cha's achievement in maintaining peace and order in an attempt to woo voters. A new advisory team of Gen Prayut comprising six leading economic experts was appointed to restore the confidence of voters just three days before the election. Meanwhile, other parties such as Pheu Thai and the Democrats have stepped up their campaigns focusing on stopping the regime from returning to power after the election. Pheu Thai has stepped up its campaign urging people to vote for the party. It has come up with its latest campaign policy called "a savings lottery scheme", hoping to win the hearts of the people. The scheme is aimed at encouraging personal savings through the purchase of a lottery ticket each month. Other campaign policies offered by Pheu Thai include the second phase of the 30-baht health care programme. The Democrat Party on March 21 released a video clip featuring its leader Abhisit Vejjajiva wooing voters. Abhisit said that every single vote from across the country will boost the party's House seats. According to Thailand’s new Constitution, the Lower House of parliament consists of 500 members, all of them elected, while a 250-member Senate will be established and all of the senators will be appointees selected by the incumbent administration. The Prime Minister will be elected by the parliament. The general election is scheduled to be held on March 24. This will be the first general election in the country since the military coup in 2014. A total of 68 candidates have been verified by the polling agency to run for the post of prime minister.